I’ve been wanting to read this series ever since I first heard about them… of course, I never get the jump on them that I want to, since I almost exclusively read paperbacks (kind of a problem when it comes to following and reading so many Indie Authors… since they’re not as likely to be in my local library) hehe. However, I recently did grab the paperbacks of books 1 and 2 in this series and, as I was in the mood for something light and whimsical… as the covers seemed to promise, bumped them to the top of my TBR pile. Ellie and the Prince is an adorable, magical retelling of Cinderella. Set in a magical and yet modern world that has unicorns and sprites alongside jet-skis and flashlights… this is not your typical fairy tale. Omar is another great character, and while the story is mostly told from Ellie’s POV, Omar does not suffer from the OUAT formula of “all the princes are kind of idiots” syndrome, which I found refreshing. He is a worthy man, and does not hesitate to take action when it is needed. Prince Briar was a bit of a mystery to me throughout the story, and I was a little concerned about a potential love triangle… but I needn’t have worried. He is nothing but honorable… and the culmination of his story came as quite the unexpected and gratifying twist of all! I loved the unique setting of modern and magical to this tale. The characters were delightful. The tone was whimsical and sweet. It was exactly the sort of story I was hoping for when I picked it up. 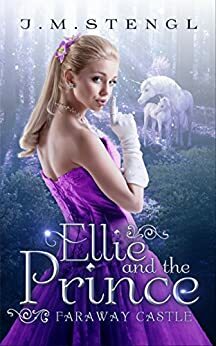 There was just enough danger and worry about the resort Director, and just enough mystery to keep the story moving along and exciting… for most of the book, I sort of forgot that this might be a Cinderella retelling, so the Cinderella elements that came in to play later in the story actually sort of surprised me… in the best kind of way! I recommend this to anyone who enjoys reading fairy tales with a few unique twists and turns! I love fairy tales re-tellings that make me forget they are re-tellings. I’ve only encountered a very few that have managed to do that for me. I was surprised at the end when I realized I’d forgotten it was a retelling! I am looking forward to reading the sequel! This was quite charming as well. It took me a bit to get a feel for the world… the modern + magical kingdoms thing threw me for a bit, but I ended up enjoying the uniqueness of it.